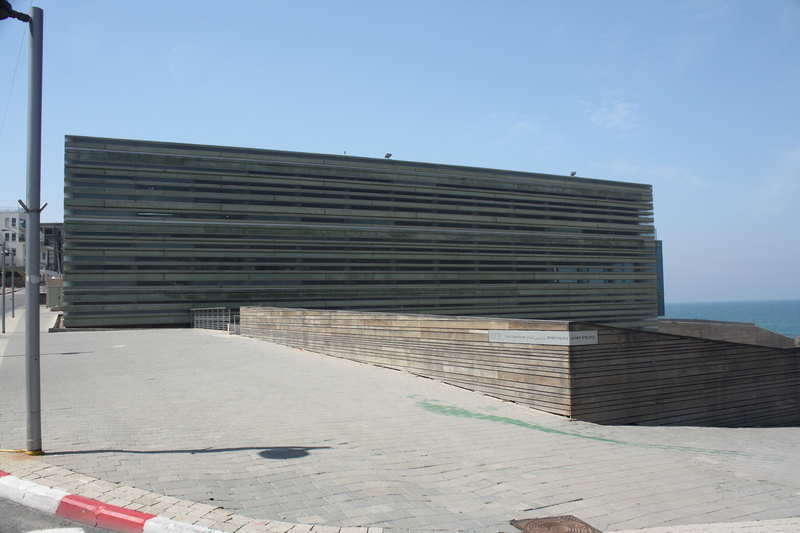 The Peres Peace Centre was set up in 1996, the brainchild of Shimon Peres who has had a long political career in Israel as Minister of Foreign Affairs, Prime Minister and, since 2007, President. 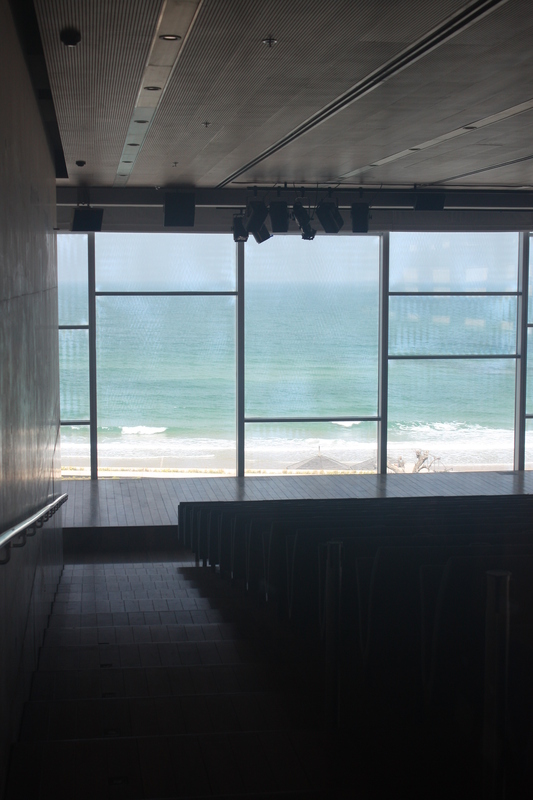 The Peace House, which was completed in 2009, is an impressive building, partially dug into the slope of a beautiful seashore site at the southern terminus of Tel Aviv’s fabulous beach promenade, in a rundown Arab neighbourhood just south of Jaffa. This is not the first site that was considered – initially the former Palestinian leader, Yasser Arafat, was also involved in the project, and the building was to be located close to the Green Line, just within the Palestinian Occupied Territories, although this site fell through. (I wonder if this was in part a similar reason to Muslala’s watermelon festival of my previous post – that Palestinians found it offensive and inappropriate for a building with a peace-building purpose to be built on occupied land.) It does seem a missed symbolic opportunity that the building is not located somewhere on or near the Green Line, but at the same time it’s hard not to be seduced by the beauty of its current site. 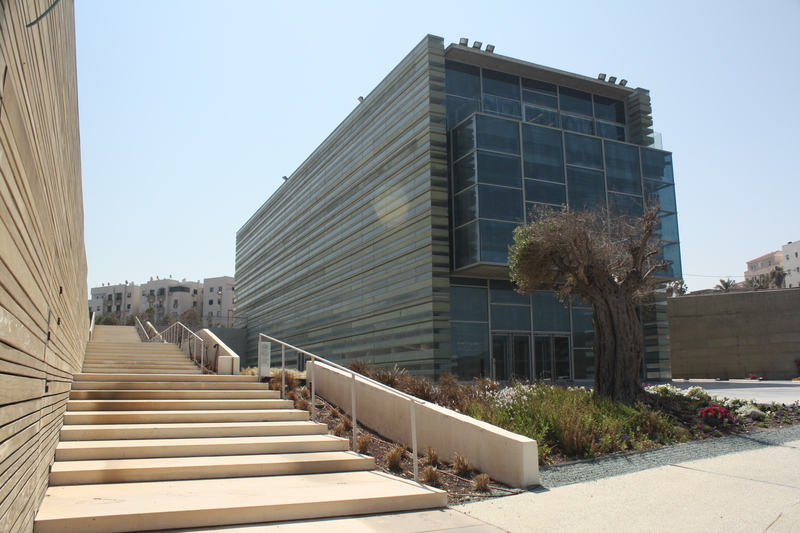 A number of ironies have been noted about the Peres Peace Centre, not least its title (Shimon Peres being both the founder of the Peace Centre and also the current president of a government which has policies some would not describe as being peaceful). As one of my Palestinian architect interviewees commented earlier in the week, “Peres with Peace does not work.” There is also the fact that it has a bomb shelter on every floor, although this sad reality is unavoidable in Israel, where I’m told it’s compulsory that every new building, even houses, must have one. The building has been criticised by some for being rather grandiose for its context and content. After all, it’s an NGO which sets out to bring people together from both communities, including the very underprivileged, and which formerly operated from an inauspicious office block before the Peace House opened in 2009. In an interview with Steve Rose for the Guardian, the former Director, Ron Pundak, said “I won’t find myself very comfortable there… But it does not reflect the Peres Centre for Peace – it reflects the vision and life and future of Mr Peres.” (Rose 2009) However, I have to say I find myself wondering why anyone would think people from underprivileged communities can’t appreciate a high quality and unconventional building just as much as the next person? The rooms take the form of internal concrete boxes which don’t quite touch (except with glass) the undulating edges of the outer shell. Not everyone outside the architecture world loves poured concrete to the extent that architects (including myself) do. In fact I was told by a member of staff of the Peace Centre that some visitors had likened its shuttered concrete interior walls to a detention centre, which is unlikely to be the association the architect was seeking! The same member of staff continued by saying that the building requires some explanation, and that all visiting groups are given a tour on which they are told architect’s concept: ‘This [building] is definitely modern art…you do require that external explanation to understand [it].’ I was reminded of something Israeli architect Hillel Schocken had written about Libeskind’s Jewish Museum in Berlin, suggesting if a building requires signposting and explanation, the architecture isn’t doing its job. (Salingaros 2008 p.84) But then I’m also hard-placed to suggest how highly poetic ideas, such as strata which represent the region’s conflict within the architecture, could ever be fully self-explanatory. 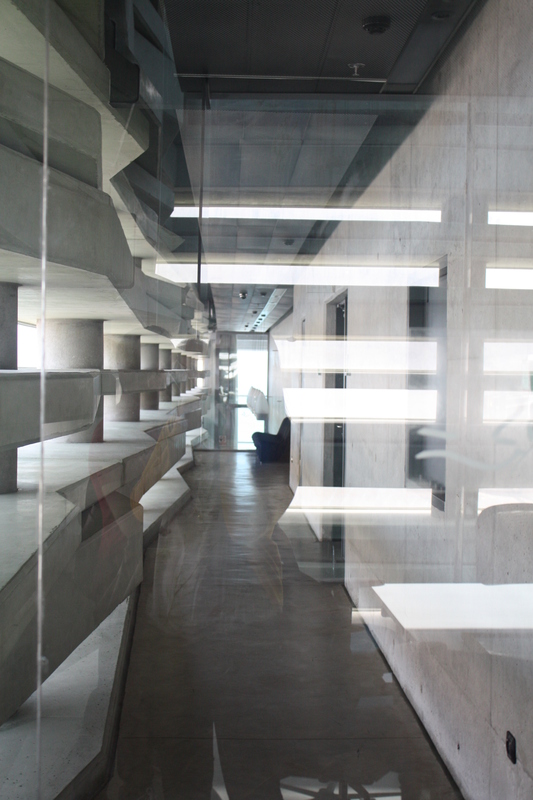 I had to chuckle at the architect’s irritation when he discovered, seemingly not for the first time, that the building’s occupants were inhabiting it in the way they saw fit, which included using the concrete layers of the external walls within their offices as shelves for their bits and bobs. 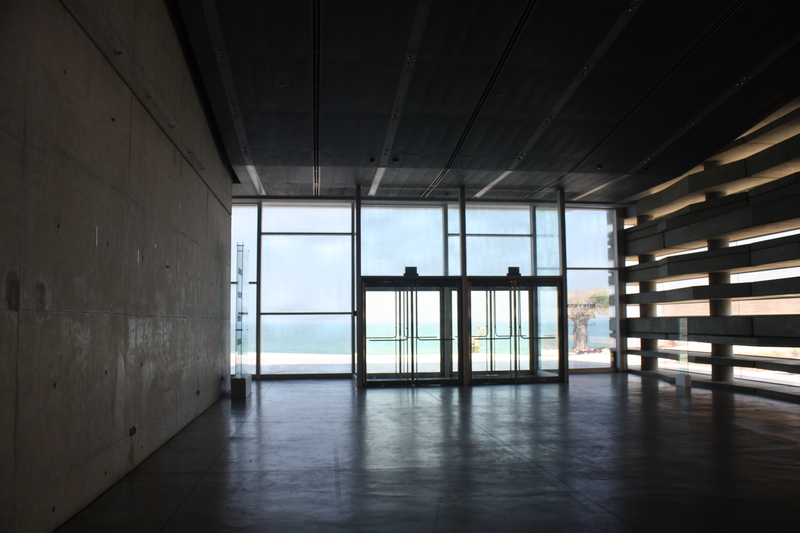 In doing so they were marring, with signs of life, an otherwise uninterrupted view along the full length of the building to the sea beyond – the sheer audacity of it!! The architect informed the staff that he didn’t want to see it this way again. 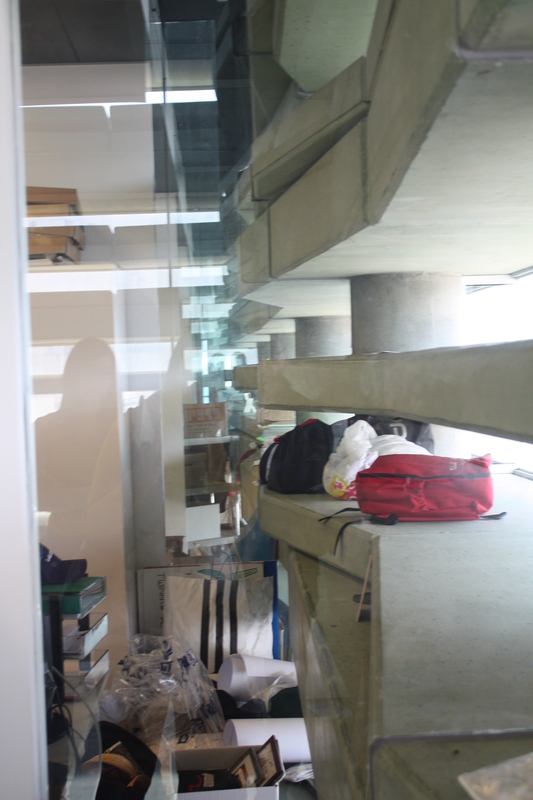 The uninterrupted view along one side of the building, and the cluttered one through offices on the other! 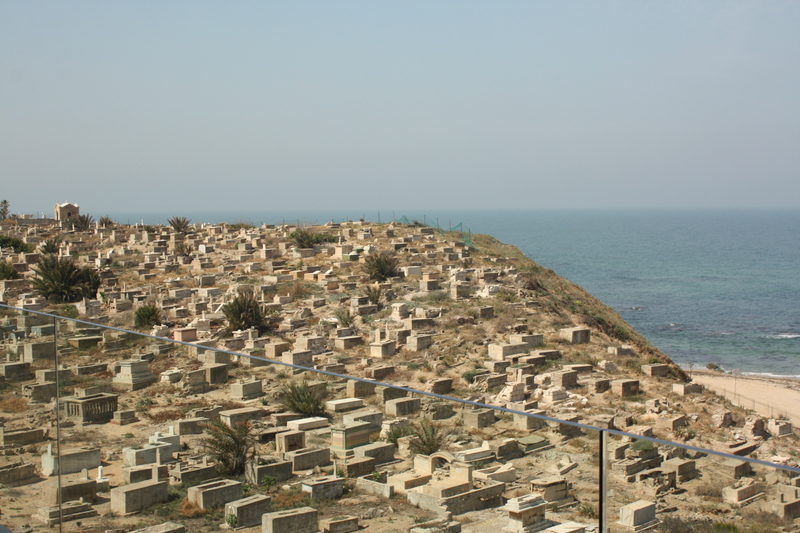 We finished the tour on a balcony at the top of the building, where we admired a view of a neighbouring old Muslim cemetery and bright blue sea beyond. Pleased with the appropriateness of a Muslim cemetery as a neighbour to the building, the architect concluded with a joke: “The cemetery is quite amazing. My joke: that it wasn’t here before – we put it [there] for the composition of the view!” Ah, architects, you gotta love’em! Salingaros, N. (2008) ‘Anti-Architecture and Deconstruction’, 3rd Ed. Solingen: Umbau-Verlag. I found this interesting post since my name is mentioned here. Let me underline that Hillel Schocken is absolutely right: a building speaks its own language, and no ridiculous made-up explanation can ever be as truthful. If people say this building looks like a prison, then that is the architectural message it is communicating. You are amused by an act of architectural totalitarianism, but I am not. Is it the architect’s prerogative to eradicate all signs of evolving life in a building after its users move in? To forbid changes that make a building more livable — in the “Peace House”! Isn’t the architect supposed to be providing a framework for human life? Saying I was amused was my (unsuccessfully sarcastic) attempt at being critical of this approach by an architect to control a building’s use by its occupants. I agree with you wholeheartedly that in order for a building to stay alive and relevant, its evolving use(s) should be informed by the inhabitants, and none of the business of the architect, unless solicited. 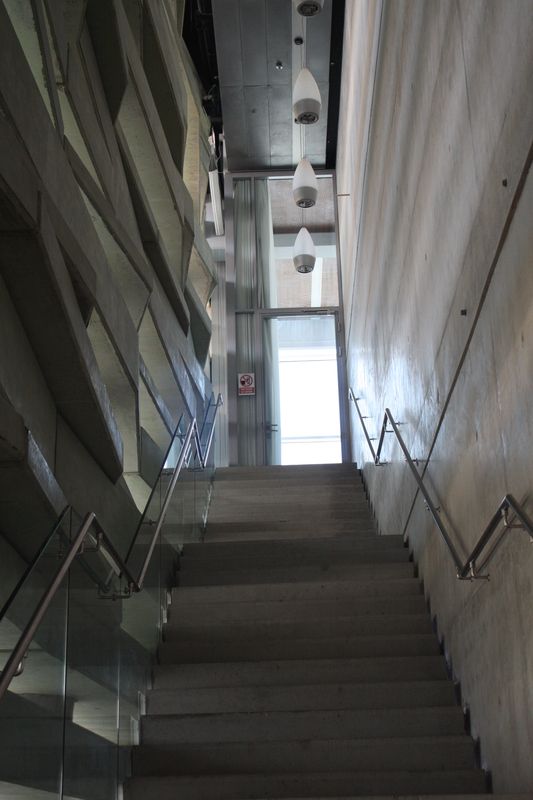 Witnessing an architect take the opposite approach was so surprising to me that my reaction was one of amused disbelief. I very much enjoyed your illuminating book, particularly the chapter on Libeskind’s not-so-different treatment of the themes of life and death in his architecture. Libeskind has just received planning permission for a Centre of Peacebuilding and Conflict Transformation on the site of a former paramilitary prison in Northern Ireland, and is promising a building that will ‘give life to the site’ and ‘build a hope-filled common ground, to tell individual stories…’ The approved design seems less than inspiring. But anyway, that’s a whole other can of worms. Hello Aisling. Please keep in touch through normal email.